Kathleen Heppell-Masys brings in excess of 30 years of public service experience in the defence, security and safety domains applied in the aerospace and nuclear sectors. 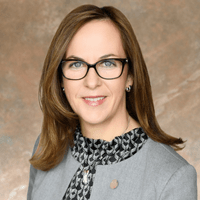 Kathleen has served in both technical and senior leadership roles with the Canadian Armed Forces, National Defence, and with the Canadian Nuclear Safety Commission (CNSC) for the last ten years. Kathleen is currently the Director General of the Directorate of Security and Safeguards (DSS) at the CNSC. DSS provides leadership and specialist advice in the regulatory oversight programs of nuclear facilities in the fields of nuclear emergency management, nuclear security, in the safeguards of nuclear materials, in the implementation of the export and import controls in support of Canada’s nuclear non-proliferation policy and in nuclear forensics. Kathleen has held other positions at the CNSC, including the Director General, Safety Management position, where she advanced the oversight of Human and Organizational Factors in the nuclear industry, including overseeing the development of the safety culture and the fitness for duty policies. In the earlier part of her career, Kathleen served with the Canadian Forces for more than 21 years. As an Aerospace Engineering Officer, she occupied various military aviation engineering support roles for several military aircraft types. Her contribution ranged from developing software for acoustic capabilities to leading large technical aircraft maintenance teams. She also served at the Royal Military College of Canada (RMC) teaching future military officers 3rd and 4th year chemical engineering courses. Kathleen holds a Bachelor Degree in Fuels and Materials Engineering and a Master of Nuclear Engineering from RMC. She has recently completed a certificate program in Public Sector Leadership and Governance at the University of Ottawa. Kathleen contributed to the IAEA Director General’s Report on the Fukushima Daiichi Accident by leading the International Human and Organizational Factors technical team. She recently presided the International Conference on Physical Protection of Nuclear Material and Nuclear Facilities in November, 2017.